Inspirational conference for schoolgirls, entrepreneurial women in business and fantastic speakers. 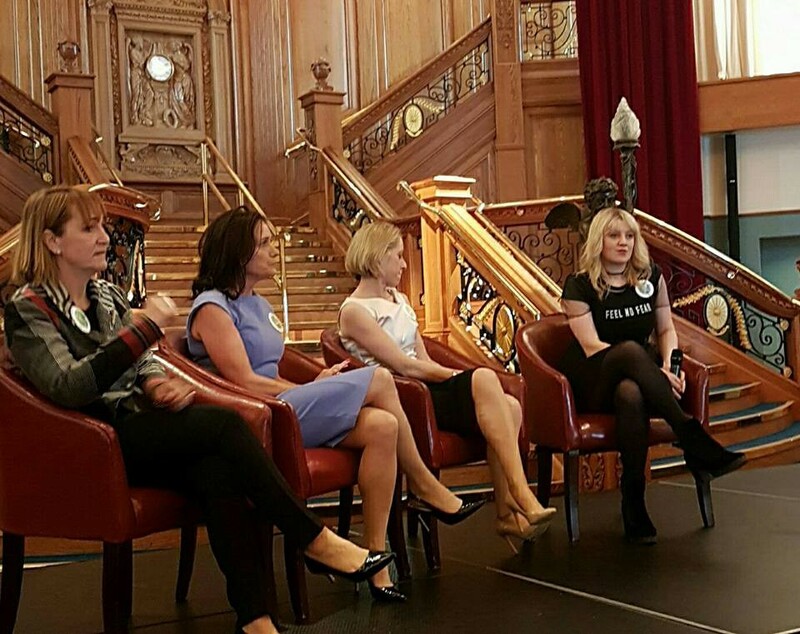 This year, to celebrate International Women’s Day, I was invited, along with several other members of LeanIn Belfast, to attend a half day conference in the grand setting of the ballroom of Titanic Belfast. There were quite a lot of photos taken on ‘that staircase’…. This was my first day out representing LeanIn, and I found it really motivating. I was partnered with seven sixth-formers from Ashfield Girls High School in Belfast. They were a great bunch — we had the chance to talk about what stops people from speaking up in public forums, about the importance of seeing other women at the top of their game — the phrase You Cannot Be What You Cannot See springs to mind. One of the girls talked about considering applying to the Merchant Navy after school,and how there weren’t that many other women on the weekend trial she attended. I suggested she try to find a woman already in the Merchant Navy to have a chat to, so she could find out the reality of life in that role, and to try and get a mentor for herself. When I think back to my time at school, my careers advice was really non-existent. It was brilliant to see all these girls in a room hearing (and talking) about how they could be, or do, anything. Another member at my table has already set up her own social enterprise, East Broadway — a local theatre company in East Belfast, with her friend. I was able to give her a connection to the current Director of Social Enterprise in NI — I am hoping she has been in touch with him. I have followed this one up as I think its important to follow through with these connections. After all, working for myself for the past few years has taught me that networking is everything. #VitalVoices walk with the girls from Ashfield Girls High School, Belfast.